There is a hole in the dive industry. Divers are getting certified in lakes with low visibility, no currents and lack of underwater animals to see and interact with. That’s why we have created a new course that takes the existing Open Water Certification Course and adds an additional section with items related to diving in the ocean: currents, marine life, weighting for salt water, etc. Scuba Professionals of Arizona’s Ocean Diver Program is unique to the dive industry. The course allows our Open Water Instructors to give new students all the information they need to become a confident and comfortable ocean diver, and not only a lake diver! It usually is a good thing to get more, isn’t it? Most scuba stores in Arizona, including Scuba Professionals of Arizona use Lake Pleasant as their primary place for certification dives since it is local and easy to get to. Don’t get me wrong, the lake is a great place to get comfortable with diving in general, and especially a GREAT place to learn to Navigate underwater. The problem with lake diving is it does not prepare you to dive with ocean currents or waves at the beach. Once a diver who was certified at the lake gets to the ocean it can become very intimidating and put them outside their comfort zone. 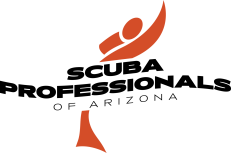 What does the Ocean Diver Program include? 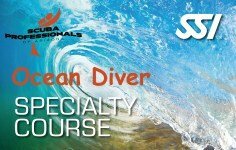 Over the years we have developed a new way to become certified that guarantees you the best in scuba diving education. Now you will be ready for either lake or ocean diving and all that may come with it. Our Ocean Diver Program has 2 class sessions where we will review oceanography, Marine Life, talk about the differences with diving in thicker wetsuits, buoyancy differences in salt water, buddy team functioning, beach diving techniques and so much more! We also conduct a pool session or two working on these skills. Who can take the Ocean Diver Program? Any certified diver who did their certifications in the lakes is welcome to join us for this program and upgrade your training. The cost is only $100 per person, which includes classroom review sessions, pool training and diving supervision on any Ocean trip conducted with Scuba Professionals of Arizona. When you sign up for an Ocean trip with Scuba Professionals of Arizona, $50 of your Ocean Diver Course fee applies to your trip. Club Aquarius members get both a discount on trip packages as well as the Ocean Diver Program. 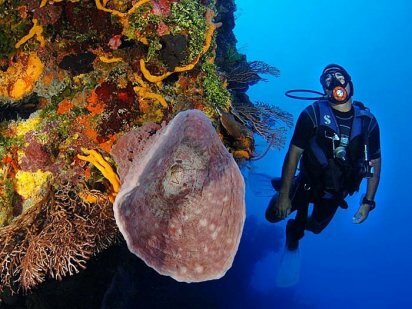 Being an active diver, diving in different types of water, and encountering different situations will help you be the best and strongest diver possible. We want YOU to be involved with scuba diving where you feel safe and confident and enjoy yourself! Read more about the Ocean Diver Program here!